On 5. Mai 1960, Joachim Kiesler, together with two watchmakers, founded the PGH "Fernsehen, Rundfunk, Uhren" (trade production cooperative "Television, Broadcast, Watches") in Geithain. A great success story began for the cooperative that was to grow from five employees (two of them being apprentices) to about 30 employees in 1972. During the first years the production cooperative was only active as service facility. In 1966 Joachim Kiesler started with first own development works. In 1972 the cooperative was disappropriated and compulsorily nationalised. It became VEB (Volkseigener Betrieb – nationally-owned enterprise) Musikelectronic Geithain (MEG). In 1992 a handful of former production cooperative members, headed by Joachim Kiesler, succeeded in retransferring the ownership of the VEB into private property. 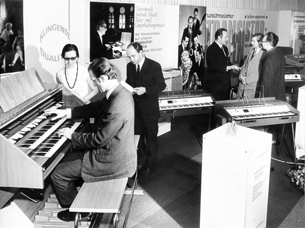 They founded the musikelectronic geithain gmbh (limited company), which is still successfully managed by Joachim Kiesler. 1966/67 saw the development of the TMV 1 transistor microphone amplifier, which was taken into in-house production in 1967. In 1969 the TMV 2 transistor microphone amplifier was created, a further development of the TMV 1. Start of development and production of the SPR 6 six-channel mixing amplifier. In 1970 the cooperative begins with the production of an in-house-developed power amplifier, which will go on the market known as LV 70. It finds its application in theatres, local cultural centres, cinemas etc. 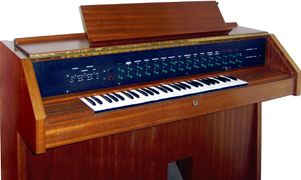 In 1970, after one year of development work, the cooperative started producing the EO 1002 electronic concert and church organ, a two-manual instrument with pedal and 37 stops. In 1972 a one-manual instrument of the same type was created, the EO 1001. With these developments, Joachim Kiesler aimed at an electronic emulation of the sound of pipe organs. Music connoisseurs indeed attested the organs "the convincingly clear sound of good traditional organs". (Quote: Concertmaster Günther Siering, according to the Leipziger Volkszeitung newspaper from April 23, 1978. Similar opinions are known from the Leipzig director for church music Prof. Georg Trexler and from Hans Otto, organist to the Freiberg Cathedral.) The recognised high quality of this instrument revitalised the discussion about electronic emulation of pipe organs. A total of about 150 organs were built and installed in churches, civil registry offices, theatres, cultural centres (even in the Berlin Palace of the Republic) in the GDR, in Hungary and in Czechoslovakia, and they are partly still in use today. Each organ had been customised according to the respective location and was voiced on site. In 1972 the V 910 and V 911 universal mixing power amplifiers were developed and produced. 1973/74 saw the development and production start of the V 733/34/35/36 studio power amplifiers. In 1976 the development and production of the V 940 and V 941 power amplifiers and of the V 920 and V 921 mixing power amplifiers followed. Those were produced by MEG in large quantities until the political changes in the GDR. In 1980 MEG develops the Uni 10 car loudspeaker for the Arnstadt Communication Equipment Factory. This loudspeaker was the first in the GDR to receive the coveted "Q" quality label. Until the political changes, about 9 million pieces were produced. In 1980 development and production started of a wide range of sound reinforcement loudspeakers for cultural institutions, continuing until today. 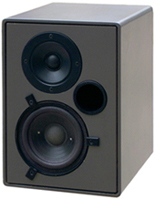 In 1984, at the Leipzig Fall Trade Fair, MEG presented the prototype of the meanwhile legendary BR 25 loudspeaker. The West German "Funktechnik" (Radio me34_contentineering) magazine attested this development to have caught up with the international state-of-the-art. The expected production quantity exceeded the personal capacity of MEG.. For this reason the development was sold to the VEB Statron Fürstenwalde in 1985. Until the political changes, about 650,000 units were produced, 50 % of which were exported to West Germany. This product, too, received the "Q" quality label, that by then had been granted only twice to loudspeakers, in both cases to MEG products. 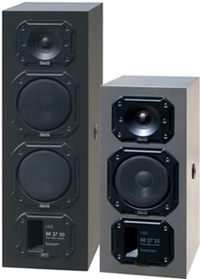 The BR 25 became one of the top-selling hi-fi loudspeakers in Germany. In 1984 MEG developed the RL 900 broadcast studio control loudspeaker. In 1985 mass production of the RL 900 started at MEG. The loudspeaker was installed in all broadcast and television institutions throughout the GDR. It also found application in several cultural institutions, for instance at the Leipzig Gewandhaus concert hall, the Dresden Semperoper opera house and the Berlin Schauspielhaus theatre. 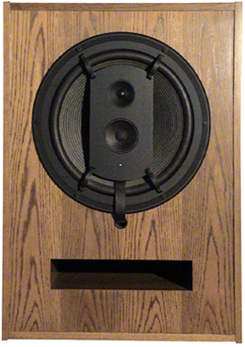 In 1987 the BR 37 two-and-a-half-way loudspeaker and the BR 27 two-way loudspeaker were developed. Their production took place at Statron Fürstenwalde. 1987 also saw the start of production of the BR 50 3-way loudspeaker, another MEG development, at the Frankfurt/Oder Energie-Kombinat state combine. It also received the "Q" quality label. In 1989/90 the German ARD network (Association of Public Broadcasting Corporations) staged a test for studio monitors. In this test, the RL 900 received the rating "best transparency and directional accuracy". After the political changes in Germany, the RL product range conquered the international market. The monitors made by MEG found their way into the most renowned European broadcast and television studios, and also were popular as home loudspeakers to music freaks. Gerhard Steinke, one of the godfathers of German electro-acoustics, called the loudspeaker RL900 "a masterpiece of musical trade". 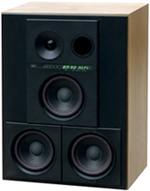 In 1992 the "Saxon Innovation Award for Economy" was granted to the musikelectronic geithain gmbh for the RL 900A and RL 904 studio monitors, which were developed by Joachim Kiesler. 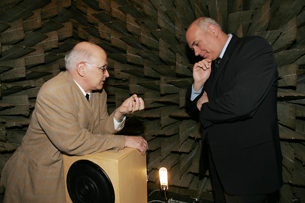 In 2005 a meeting between the Saxon Minister for Economy, Thomas Jurk, and Joachim Kiesler took place in the acoustic reference room in our company.